BURBANK, CA – Animators, special effects artists and martial arts fans gathered at the Martial Arts History Museum Friday to enjoy the works of one of the true masters of special effects and sculpture, Hiroshi Katagiri. 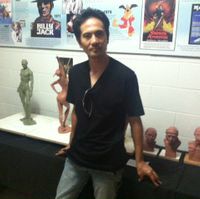 Katagiri, an Emmy-Award winner, has done special effects for such films at Pacific Rim, The Hunger Games, X-Men and more. Some of his unique creations were on display for fans to admire. “This was a great event for the Museum. Art plays a huge role in the martial arts and its important that the Museum creates those bridges of understanding,” notes Museum president Michael Matsuda. A newly released book by Katagiri was also made available through the first of many book signings. “I believe it is important that people support the Museum so I was glad to bring my work here,” says Katagiri. As an additional highlight to the open-house evening event, Katagiri showed clips from his new film in the making Gehenna. Gehenna is a horror film based upon the haunting of the old Japanese bunkers during WWII. The Martial Arts History Museum continues to host a number of events throughout the year. From art displays, photo exhibits, martial arts demonstrations, cultural performances to even a martial arts convention called Dragonfest. It is a non-profit 501(c)(3) organization and is fully supported by donations, sponsorships and memberships. For information on the Museum, visit www.MAmuseum.com or call (818) 478-1722.